Disneyland claims to be “The Happiest Place on Earth” but is it when you bring your 20 month old baby boy along? 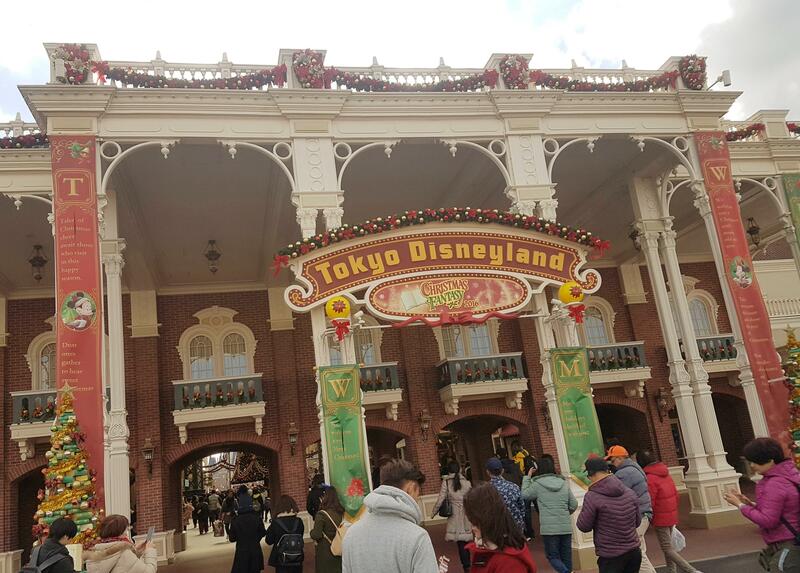 Tokyo Disneyland (東京ディズニーランド) first opened its doors in 1983 and have since then consistently been one of the most popular theme parks in the world, welcoming over 16 million visitors annually. Starting from the very first step, buying tickets online through the Tokyo Disney Resort website is easy enough and definitely recommended. Simply print off the tickets, present on entry, and skip the queue. Getting to the Park via JR Train isn’t all that complicated either, but it’ll generally involve changing train lines. You’ll need to be on either the red JR Keiyo Line (京葉線) or organe JR Musashino Line (武蔵野線) to get to Maihama station (舞浜駅) . Don’t worry if you’re travelling with a stroller, lifts (albeit tiny ones) are available at the stations. As you enter, you’re given a map of the park along with a timetable of all the shows and parades on for the day. It can be a bit overwhelming and with hindsight, you’re better off planning ahead and working out what are the ‘must-see or must-dos’. 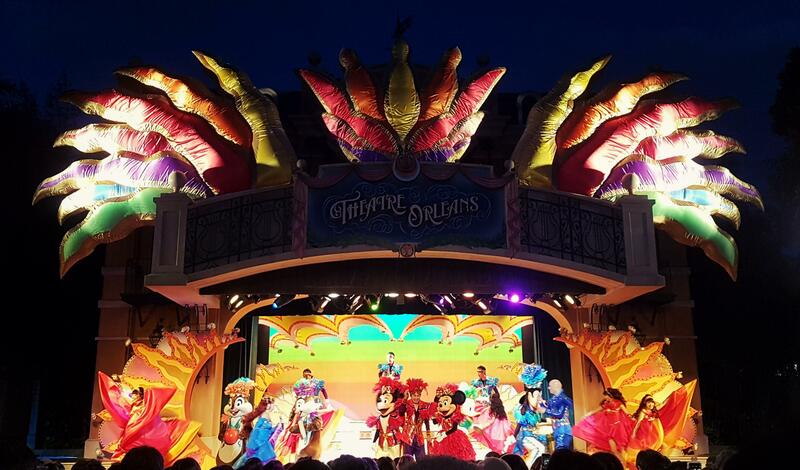 For us, we weren’t too fussed and knew our little boy wouldn’t be able to go on most of the rides apart from those in Toontown, so we focused on the shows. Our first show on the day was One Man’s Dream II – The Magic Lives On at the Showbase which goes on for 30 mins. It does fill up quickly so you need to get there 15-30 mins before the show starts. On busy days, tickets are issued on a lottery basis, so you should check with staff if this is one of your must-see. Strollers are not allowed in for obvious reasons but there are designated areas to park them nearby. If you have a really popular stroller, it’s best to put something distinctive on it, otherwise it may be difficult to find later. 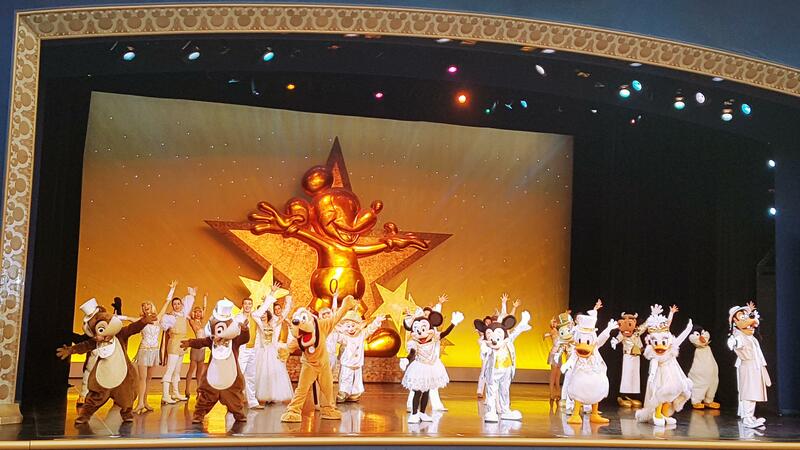 The show itself is essentially a singing, dancing show that showcases a number of well-known Disney Characters like Mickey, Minnie, Donald, Daisy, Goofy and friends. Unfortunately, like most other things, everything is in Japanese only, so you can’t really follow the story. Luckily it didn’t seem to bother little R who happily moved his body to the tunes. The daytime parade features several colourful and vibrant floats carrying favourite Disney characters. Personally, watching a parade is a must at Disney but if you don’t have enough time, I’d recommend skipping the daytime one and wait for the nighttime parade…more on that later. Come lunchtime, we were rather disappointed as most sit down restaurants required advanced booking, something we weren’t aware of. Apparently since April 2016, Disney introduced what they call ‘Priority Seating’ aka advanced booking which you can do online. The catch is it’s only in Japanese! For anyone that doesn’t know Japanese or have an address/contact details in Japan, it’s extremely difficult to make a booking yourself (even with the help of Google Translate). In our case, since we wanted somewhere comfortable and warm to sit down instead of having a hot dog in the cold, the only option we found available (after 4-5 attempts) was to queue up at the Queen of Hearts Banquet Hall. Essentially a cafeteria where you take a tray and pick up what you want along the production line, from entrée to dessert and drinks. If you go the full course, expect ~2500 yen (AU$30) per person or 920 yen (Au$10) for the kids meal which is served on a cute mickey mouse plate. Don’t expect too much from the food, it’s not bad, but far from “wow”. Minnie Oh! MinnieAnother show we went along to was Minnie Oh! Minnie at Theatre Orleans. Another all cast singing and dancing show – Latin style. There’s a bit more audience interaction at this show but again everything is in Japanese so it can be a bit hard to follow. The only ride we managed to get on was “it’s a small world” which is a boat ride past a colourful collection of singing figurines representing cultures around the globe. Come dinner time, luckily for us, I did make a reservation in advance at The Diamond Horseshoe which is a dinner & show (Mickey & Company) experience. Online reservation opens one month in advance but again is only available in Japanese. To get around the issue, I asked the hotel concierge to book it which made it so much easier. There are 3 types of tickets/seats (S, A and B) and I didn’t really know what the difference was so we went with the mid-range A seat which is 4,530 yen per adult (AU$52). You do need to redeem your ticket at the booth just outside the restaurant on the day, but that part was relatively straight forward. Doors open at 18:10 and once you’re seated, wait staff starts serving dinner which includes a fruit punch (free refill), salad, bread roll, a mixed bowl of meat, sausage, sea food and mash, and dessert. Again, don’t expect too much of the food and the efficiency from the staff clearing the tables can make it all seem a bit rushed. The show itself is really not that different to any of the free ones but you do get opportunities to see the characters up close as they roam around the dining hall. Little R cried when Donald came around and stood too close LOL. The highlight for us was the Night time parade or the “Electrical Parade Dreamlights” where each of the floats really sparkle and light up the park. If there’s anything that’s not to miss, this is it! Fireworks display at Disneyland Park in Anaheim, California was quite a memorable event but Sky High Wishes as they’re called at Tokyo Disneyland was very much a disappointment. I’d spend your time on other things like hitting the shops. So what’s the verdict? Well, Tokyo Disneyland was alright but we won’t be rushing back. I think the fact that everything was in Japanese only made it less enjoyable (for the adults). It’s worth mentioning that change rooms are easily accessible throughout the park and you definitely won’t be alone in bringing baby/toddlers along. If you’re really keen to bring your little one to Disneyland, I’d recommend going to Hong Kong Disneyland. Firstly, it’s much smaller (some find this a disadvantage) making it easier to navigate around, food is better and the quality of the parade and shows are equally good.